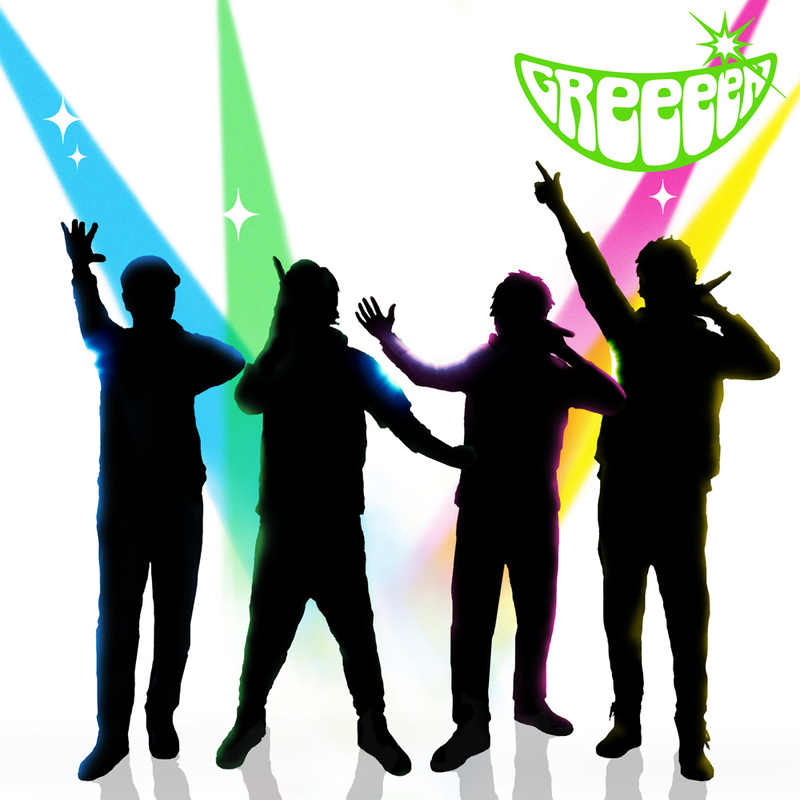 GReeeeN (also known as The Green) is a four member Japanese group from Koriyama city in the Fukushima prefecture. They made their debut with Universal Music [Nayutawave Records] in 2007. Their logo image is of a mouthful of teeth, and the four e’s indicate the number of members. The sound production is handled by Hide’s older brother JIN, a member of Pay Money To My Pain. One notable characteristic is that none of the members have ever shown their faces in the public sphere as a part of GReeeeN, whether in their promotional videos, CDs, television performances, or the Internet. In their only performance on TV-U Fukushima’s music show Music Bar Palo Palo (broadcast on January 19, 2007), the group even went as far as censoring their faces during the performance. GReeeeN cites keeping their professional lives in dentistry compatible with their musical ventures as the reason, but one of the members, Hide, has hinted that after all of the members pass the prefectural examination in dentistry and receive permission from the directors of the hospitals they work for, the group may consider a public appearance. All members studied at the dentistry department at Ohu University, in Fukushima prefecture. The group debuted while still in school in 2007. The members of the popular band GReeeeN have finally achieved their goal, because all have passed their dentistry exams. GReeeeN is a J-Pop band consisting of four members, Hide, navi, 92 and Soh. Before their major label debut in 2007, they released a number of independent singles. They currently have three singles released, with the most current, Ai Uta, having a peak position of 8 on the weekly Oricon charts and 2 on the daily charts. The band’s debut album, A, domo. Hajimemashite., was released on June 28th, 2007. They have never shown their faces in public. Their 7th single, Kiseki, reached number 1 on the Oricon charts and has sold over 500,000 copies. The song was ranked at the number-one position on the Billboard Japan Hot 100 Singles Yearly Charts. Their 8th single Tobira is certified Gold by RIAJ for shipment of 100,000 copies & their 2nd album A, Domo. Ohisashiburi Desu. been awarded Million status by RIAJ for shipment of 1 million copies . Their 9th single Ayumi is certified Gold by RIAJ for shipment of 100,000 copies . Their 10th single Setsuna is certified Gold for shipment of 100,000 copies .